The production and transportation of food and drink can be a difficult and sometimes even dangerous endeavor. Looking at some of the biggest food-based mishaps that have ever occurred, we turned the weirdest and deadliest ones we could find into fact cards. These food disasters brought about death and destruction, and racked up millions of pounds in damage. Read on to find out more about the strangest and deadliest food disasters in history. 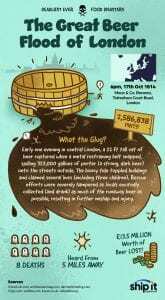 A beer flood might sound like a dream come true but it actually caused quite the catastrophe in early 19th Century London, when a giant 22ft vat of beer ruptured in the city, in 1814. The vat belonged to the Meux & Co. Brewery on Tottenham Court Road and when it erupted, it unleashed over 300,000 gallons of porter onto the surrounding streets. The disaster was heard from five miles away and resulted in a loss of £13.5 million (in today’s money). So much beer spilled that if it was to happen today, it would take the entire population of Haringey, the London borough this brewery was located in, a month to drink it all. That’s over 270,000 people. 8 lives were claimed in the disaster, which was exacerbated by the fact locals tried to retrieve and drink as much of the beer as possible. This tsunami of beer even knocked down entire buildings. If you’ve ever wanted a flash flood of beer to take you away, you may want to be careful what you wish for! Bet you never thought you would do anything to go back to the year 2013… it was an easier time and we didn’t know how good we had it. But 2013 was actually the year that one of history’s strangest food disasters occurred, in the north of Norway. As a lorry driver was to discover, large amounts of caramelised brown goat’s cheese can combust spontaneously in transit and once it’s alight, it’s very difficult to extinguish the blaze. According to a Norwegian police officer that was on the scene, the amount of fat and sugar in this cheese, known as Brunost, can cause it burn like petrol. The lorry driver was making his way through the Brattli Tunnel at Tysfjord when he noticed the calamity. 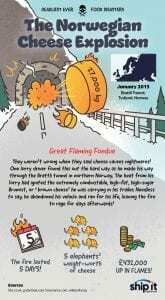 He abandoned the precious cargo, leaving 27 tonnes of Brunost to burn. The blaze went on for 5 days as the toxic fumes severely hampered rescue operations. Once extinguished, the tunnel was closed for several weeks for repairs. Talk about a rough day at work. In 2017, a PepsiCo-owned warehouse in Western Russia caused quite the flood. You’ve probably heard of Pepsi, the soft drink known best for its unofficial slogan ‘We’ve only got Pepsi, is that alright?” Well its creators, PepsiCo, also own and distribute Walker’s crisps, Tropicana juices, Copella, Snack-a-Jacks, and 7UP. 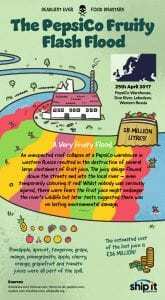 As a result, when the roof of a PepsiCo warehouse in Western Russia collapsed, 28 million litres of fruit juice seeped into the local river. At one point, there was so much juice it turned the water red! Luckily, no one was injured and there was no lasting damage to the river’s ecosystem. We imagine all the fish in the river tell folk stories of the day their water tasted so fruity, and will continue to do so for many years to come. In 1878, the largest mill in the world was based in Minneapolis. Known as the Washburn A Mill, it met an untimely demise at the hands of a flour dust explosion. There were fourteen men on the night crew at the time. The flour mill was powered by river water, was seven storeys high, and was one of the largest employers in the city. An hour after the night crew started their shift on the 2nd May 1878, there were three giant explosions. The fire spread to surrounding mills that also then exploded. All fourteen of the night crew were killed in the explosion, as well as four workers from other mills that exploded in the aftermath. Six mills were destroyed altogether. It was determined that two of the millstones had run dry. They were rubbing together, which eventually caused a spark. This spark ignited the flammable flour dust in the air, causing the explosion. 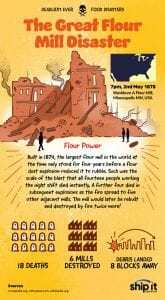 The explosion caused production of flour in Minneapolis to decrease by almost 50%. One January morning in 1919, the city of Boston in Massachusetts woke up to a disaster of epic proportions. The temperature was unseasonably high, which caused a huge vat of dormant molasses to ferment rapidly. The molasses expanded as it fermented, and eventually the poorly-constructed vats that contained it gave way. The vat buckled, unleashing a 40 foot wave of molasses onto the city, which travelled at around 35mph. As the molasses slowed, it thickened. 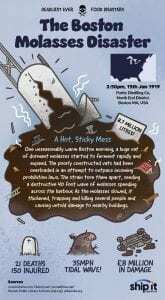 This giant wave of hot sticky molasses damaged buildings and trapped those inside. 21 lives were lost to the wave and over 150 people were injured. The molasses caused over 8 million pounds in damage. The company that owned the tank tried to claim it had been blown up by anarchists but after three years of hearings, they were deemed responsible. The family of every victim got $7,000 in compensation. The flood lived on in folklore for decades, with local residents claiming that for years after, you could still smell the molasses on a hot summer’s day. Storing and transporting your favourite foods come with its own set of risks. Admittedly, some of these disasters were made much worse by virtue of the time they occurred in, but I bet you never knew that caramelised brown goat’s cheese was so deadly! Browse our website for the latest and greatest domestic appliances on the market. From gorgeous cooker hoods to powerful range cookers and efficient refrigeration, we’ve got a ton of great products on our website at even better prices. With free delivery to the majority of the UK, there’s no extra shipping fees to get your hands on the appliances you want and need. Find out more and save money when you buy online today at Ship It Appliances!